Written in 1999 for Alyson Porter (now Alyson Aronson), Director of Music of St Martin's Church, Epsom. The tenor line in "Glory be to the Father" is the same in both canticles, and needs to be heard. Magnificat makes extensive use of pedal points and contrasts 4/4 and 7/8 time signatures. Nunc Dimittis has a duet for soprano and alto, mostly in thirds. There is also a two-part arrangement of this movement. 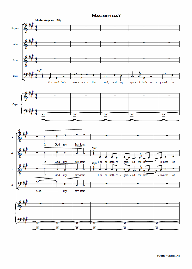 For four-part mixed choir, occasionally divisi, and organ, with brief parts for soprano and alto soli. Canticles for the Anglican daily Evening Service, also called Choral Evensong or Evening Prayer. The gospel text of Nunc Dimittis is read at Candlemas and Magnificat relates to the Visitation. The opening of the 7:8 section could make an unusual ringtone.